I am a fan of grains, and not only for baking bread. I remember seeing “wheat berries” in a recipe years ago, and searched for them in stores just out of curiosity. Now I have so many types of grains in my pantry that I get confused as to what they are and how to cook them and what recipes to use them in. So I am putting that information here in one place, one grain at a time. We all know what a grain is, right? It’s the wheat that makes up our bread, the oats in our breakfast cereal, the corn in our corn bread, the rice in our risotto. A grain is usually the edible fruit of grasses, although grains can be harvested from other plant families, as we shall see. A grain is made up of an endosperm, germ, and bran. “Whole grains” are the natural form of the grain, containing all three, and have carbohydrates, fats, oils, protein, and vitamins and minerals. Our food industry refines most of our grains, removing the bran and the germ, leaving products that are mostly carbohydrates. But that’s what we love! White flour combined with sugar (pure carbohydrate) and fats make our delicious cakes and pie crusts and muffins and cookies. I am as guilty in my love of these foods as most Americans. But ever since my early twenties, I have tried to get myself trained to like whole grains. And this is a continuation of that training, and of a search for healthy grains. Now, let’s get to the first of the grains I studied: farro. Farro is a type of wheat, or grass, but different from the common US cultivated species of wheat. It is called an “ancient grain”, or an “heirloom grain”. Ancient grains were first used thousands of years ago, and the seeds passed down over the generations. Are they all more nutritious than our current whole wheat? Perhaps yes, perhaps no. But they are certainly different in flavor and texture. And it’s fun knowing the grain you are eating has been passed down carefully, generation to generation, as a tradition. According to Wikipedia, farro is the term for a species of wheat that includes spelt, einkorn, and emmer. These grains are called “hulled wheat”, or wheat that cannot be threshed (threshing removes a grain from the husks). 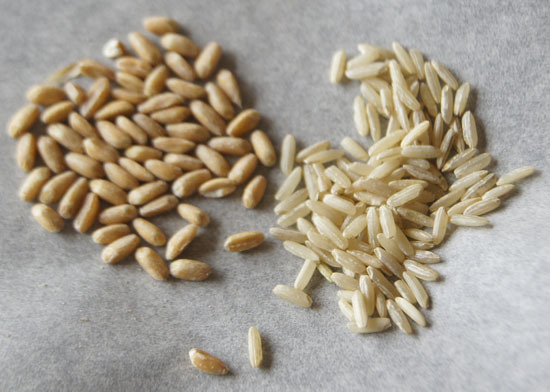 “Farro” is often used to describe these three different grains, without specification. The Healthline website explains the confusion. The farros that I bought locally did not specify whether they are spelt, einkorn, or emmer. So far, I have found Bob’s Red Mill farro in local whole food and regular markets, and Trader Joe’s carries a “10 minute farro”. This grain project of mine is a work-in-progress, and I’ll update as I learn more about the specific make-up of available farro. Farro is what is called an “ancient grain”. This term even has its own Wikipedia entry. 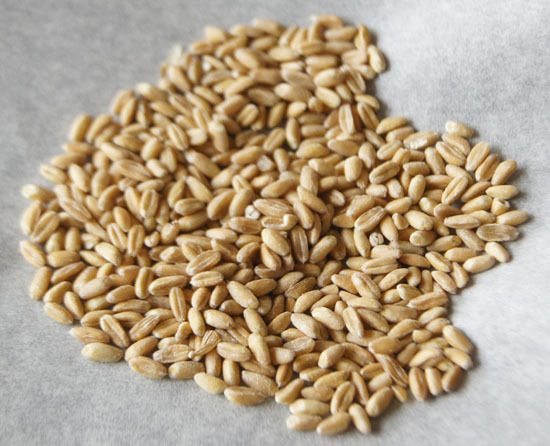 Bob’s Red Mills calls farro “the traditional grain of the Mediterranean” and “a hearty grain that was a mainstay of the daily diet in ancient Rome” and the “mother of all wheat”. It is still a favorite grain in Italian cooking – although I did not notice it in any of my Italian cookbooks. Emiko Davies’ blog has a great entry on farro, including its use in certain regions of Italy, its nutritional benefits, and a recipe. Farro, like all grains, can be milled into flour. I found “emmer flour” online but haven’t tried it (emmer is of the 3 species of wheat that are all called farro). King Arthur flour has an ancient grains flour, but it has no farro in it. King Arthur Flour sells an ancient grain blend, of amaranth, millet, and sorghum, but it has no farro in it. What does farro taste like? Like a nutty and chewy wheat grain. It is similar to wheat berries, and chewier and tastier than bulgur. I’d say, it tastes great! I even got my hubby to like it. He is happy with it as a substitute for rice. 1/4 cup dry has 200 calories (value from the Bob’s Red Mill package). 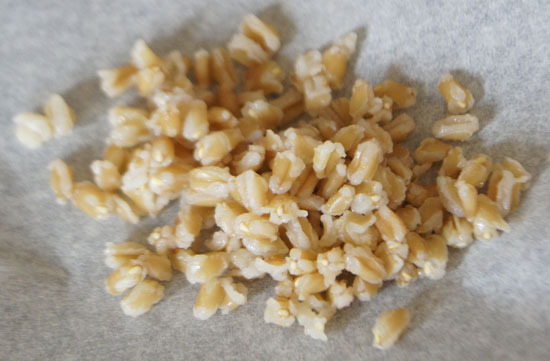 I cooked 1 cup dry farro – after cooking it had a volume of 2 3/4 cup. So, if I have a pile of cooked farro and want to eat 200 calories, that’s .69 cup or just under 3/4 cup cooked. 1/4 cup dry farro has 37 grams total carbohydrate and 7 grams protein and 7 grams dietary fiber. No vitamins A or C; 2% daily calcium and 10% daily iron. The glycemic index is 40, called “medium” GI. As a comparison, whole wheat berries have a GI of 41. White flour has a GI of 85. Old-fashioned oatmeal has a GI of 58. The Healthline website has a good discussion of the nutrition of farro. Proponents of ancient grains (like farro) claim that they are high in omega-3 fatty acids and antioxidants, and claim that they have more health benefits than modern grains. If you compare ancient grains with today’s grains, you would have to compare the whole grain. Perhaps they are more nutritious, but I’d have to see a study that compares “apples with apples”, or “whole grains with whole grains”. Put farro in cold water and bring to a boil and then turn down to a simmer according to the recommended time in the table below. I like to add about 1/2 teaspoon salt for 1 cup of dry grain. The grain will use up most but not all of the water. I cooked regular farro about 25 minutes in already boiling water and drained it immediately, then covered until I was ready to use it. That worked great too. You can toast the dry farro before cooking to bring out a nuttier flavor, and you can add seasonings to the cooking liquid or use stock instead of water. One source suggested soaking 1 cup farro in the refrigerator overnight, draining, add back 3 cups water, simmer 10 minutes, then drain excess liquid. Bob’s Red Mill suggests pre-rinsing. Do not overcook farro, it’s good a little crunchy. 1 cup cooks to 2 3/4 cups, so dish up 3/4 cup for 200 calories. How do I use farro in my daily cooking? I use it instead of rice, under a saucy pork paprika or a stir fry. I add it to soup, like beef and vegetable soup. I like cooked farro the next day, in a cold salad mixed with olive oil, a bit of vinegar or lemon juice, a little sharp cheese, nuts, miscellaneous raw veggies, and any fresh herbs I have around. I first tried making farro yeast bread: I added 1/2 cup cooked farro to My Daily Bread. It tasted really good, especially as toast, but it did not rise well and it was super moist and well, heavy. My second try was a success. First, I put 1/2 cup dry farro in a food processor and ran it until it was flour-like. This took about 10 minutes, and it still had a few grainy bits in it. It weighed 3 ounces, so for the rest of the My Daily Bread flour mixture I weighed out 9 ounces. I put the buttermilk in my breadmaker, then let it sit a couple hours, hoping to soften the farro bits. Then, I added the rest of the ingredients and turned the breadmaker on. It turned out perfect! More flavor than my usual “my daily bread”. The Ideal Energy Meal: Farro Salad. (Emiko Davies blog.) This exactly how I like my “energy” salads. Farro recipes. (Food Network.) A great collection from Italian farro soup to salads to sides to main dishes. Epicurious has a collection of salad and main dish recipes. Sixteen farro recipes on Food52. Food and Wine has a nice collection, including a slow-cooker recipe. Italian Farro Salad recipe on Well Plated. Farro with Mushrooms on the NY Times website.